Diego Maradona has backed the use of video assistant referees even though he is aware that his infamous 'Hand of God' goal would not have stood had the technology existed then. 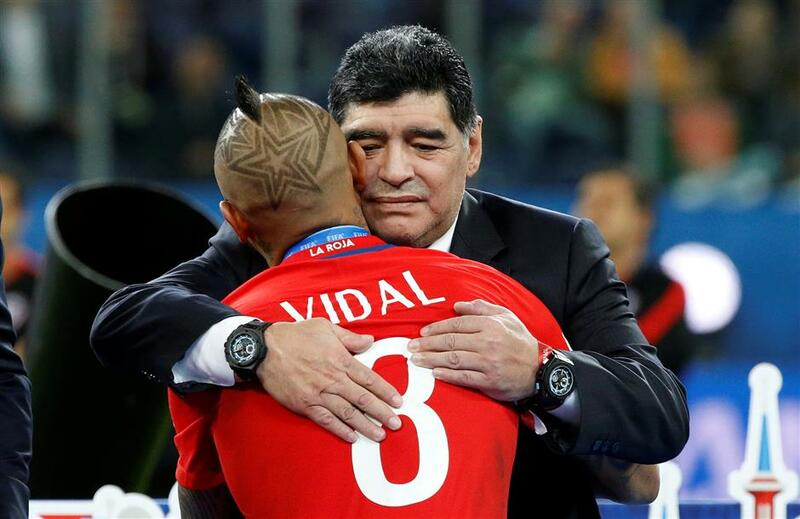 Argentina soccer great Diego Maradona hugs Chile midfielder Arturo Vidal after the FIFA Confederations Cup final between Chile and Germany in St Petersburg, Russia, in this July 2, 2017, photo. Diego Maradona has backed the use of video assistant referees (VARs) in soccer even though he is aware that his infamous 'Hand of God' goal would not have stood if the technology had existed during his heyday. The goal during the 1986 World Cup quarterfinal between Argentina and England is one of the most talked about in the history of football, alongside his brilliant solo run past five defenders in the same game that gave his side a 2-1 victory. "Obviously I think about it whenever I show my support for the use of technology," Maradona said in an interview posted on global soccer's governing body FIFA's website (www.fifa.com) on Tuesday. "Football can't fall behind. Given the rate at which technology is advancing and the fact that every sport uses it, how can we not think about using it in football?"